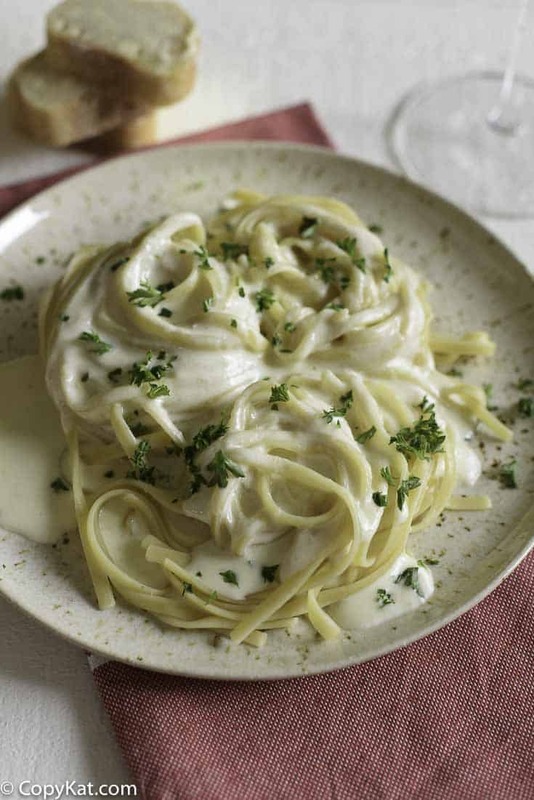 Olive Garden Alfredo Sauce is a rich, creamy sauce that you can make at home. This recipe is one of the first ones we attempted to recreate, it’s one of my favorite recipes of all time. This recipe is simple: butter, cream, cheese, and a little bit of patience—and everyone will think you are a five-star chef. When ever people ask me what my favorite recipe is, I have to tell them it is the Olive Garden Alfredo Sauce. This is the recipe that started my whole journey into copycat recipes. I went to high school in a very rural area. When I say rural, I mean in the middle of nowhere, for me, nowhere was Coldspring, Texas. The nearest Olive Garden was about 1 hour away. It was a treat to go there. When I was in high school, I had to check books out of the library to read and learn new recipes. This was a recipe I continually tried over and over. They really serve up a very basic Alfredo sauce, and while that doesn’t take away from the recipe, it just means you can make this recipe very simple, and it is naturally gluten-free. I hope you enjoy this version of my Olive Garden Alfredo Sauce. Be sure to check out my many other recipes from the Olive Garden. 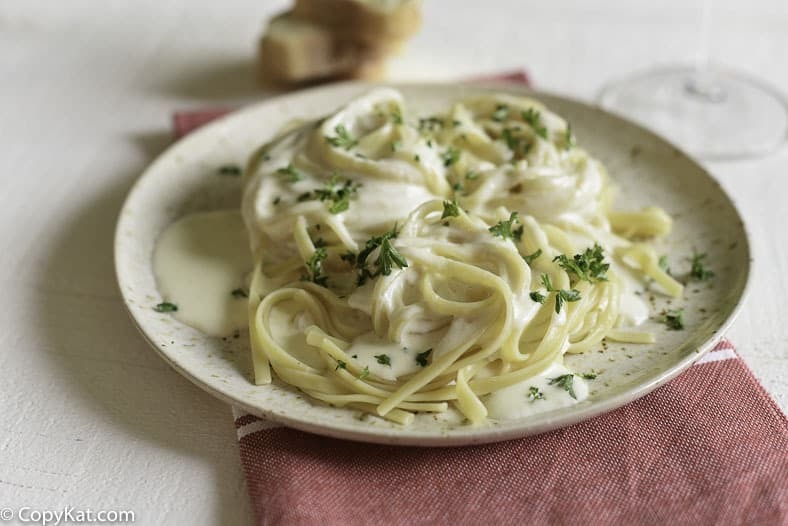 Make Olive Garden Alfredo Sauce at home. In a saucepan, brown garlic puree, in butter. Add the cream and milk to the browned garlic. When the butter and cream becomes bubbly, add Parmesan cheese, fontina cheese, and salt and pepper. Stir on medium-high heat until sauce thickens. Turn off heat and continue to stir. Makes 1 gallon.This recipe is one that was posted on Copykat.com by chef4fun and is chef4fun's version of the Olive Garden Alfredo Sauce. For the Alfredo sauce from Olive garden do u need fontina cheese ? You have it on the ingredients & not in the video? I’d love your feedback because I really preferred this method, fast, easy, cheap, and delicious. Oh and a pint of heavy cream! Nikki, this was not my recipe that you wrote. My recipe has always been the same as listed here, but I think I said add 2 tablespoons of cream cheese. Gloria Pitzer’s recipe omitted the heavy cream, and I think it was milk and cream cheese with some Parmesan cheese thrown in. The other well known recipe that I can think of was years ago Olive Garden was suggesting to add 6 egg yolks to the sauce. I personally never added flour to this recipe. Stephanie, Nikki P. Is correct that the recipe in text is not your original. I experienced the same thing when I went back to my bookmark to check my memory. The recipe it states is chef4fun’s version. It make 1 gallon of sauce! Your recipe video shows the recipe that I fell in love with. Ditto this and the other comment, it has been changed the original did not use puréed garlic or fontina. I’d know as I hate fontina cheese and worked at OG. The orginal OG recipe is actually different and closer to your original recipe that was listed, which I liked better. Technically not allowed to give up the real recipe, but I will say when I worked there, no flour was used or eggs. Also it’s done in large batches. The recipe is basic to be honest, and is designed to appeal to average tastes. That’s the downside to their sauce but also smart from a business side. Only thing I wish is that I could find is a decent cooking wine for their Marsala sauce, last one I used had to be modified to be edible, thank god my grandmother taught me how to cook and fix a ruined sauce on the fly. Your not crazy Nikki. Lol. Your welcome. I have the original recipe! I wrote it in my cookbook. I came here to easily copy and paste, but you are right….It is not the same. That’s exactly what I do and noticed the recipe is different when I opened the bookmark. Turns out perfect this way! Yum! I am a little concerned, did you use salted butter or unsalted? There is a difference. Just made this tonight, cannot wait. Added a few adjustments. Used roughly 3/4 stick of butter. 1 cup freshly shredded parmesan, garlic salt w/parsley, pepper, parsley, and this seasoning we love called “Slap Ya Mama” (it’s essentially salt, red pepper, black pepper & garlic). I didn’t measure but only sprinkled in a bit of each to taste. Then, to really shake things up, we had 3 strips of thick cut cherrywood bacon leftover from dinner lady night, so coarsely chopped that and in iut went to the Alfredo. Delicious. Thanks for a great recipe! Hope it’s ok to tweak it a bit. Oh my GOSH! I absolutely love this recipe! 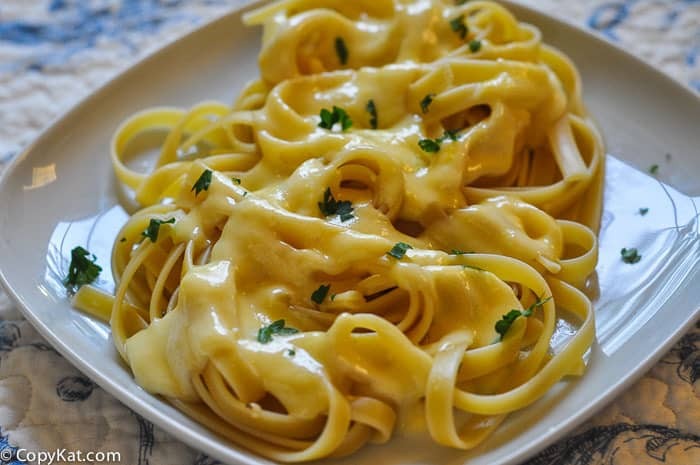 It’s my go to recipe when I want a good fettuccine Alfredo AT HOME! Thanks so much, I love how simple this recipe is! Thanks for the recipe. Can’t wait to try it out. Awesome recipe, love it, but can i freeze it to use some another day? How long would it be good if I can? It may work, I have to be honest, I don’t freeze a lot of stuff. I would cut the recipe in half, and just make a smaller portion. I wished I could speak to using a freezer, but I can’t. I absolutely love this sauce but is there any way I can get it to be less oily? When I make it, it sets up great but oil settles out of it onto the sides of the pan and bubbles up from the bottom. Am I the only one who has this issue? Hi, yes unfortunately it is very oily. Olive Gardens Alfredo sauce is actually the same way. I would say use less butter, this is the only thing I could think I that would make it very oily. This sounds like a heat source problem and a stirring issue. This sauce much like olive gardens has to be watched at all times because if it starts sticking at bottom of pan then you will have separation of fats and solids. Every stove top if different so start at a lower temp and work it up to a light simmer temp. Once its at right temp use a metal wisk and wisk regularly. This sauce should not be allowed to stick to bottom at all but will want to if you let it and thats when it starts to separate. If it does happen start wisking where it is scraped off bottom of pan to prevent complete separation. When reheating this sauce it has to be brought back up to temp slowly at an even lower temp thats just how homemade alfredo is. Also if its your local OG sauce is separated let them know as if its an old pan of sauce they will dump it and open up another bag from the batch unless the guy that made the bulk batch ruined it to begin with….. even the pros make this mistake sometimes but best of luck you’ll get it. i made it for my daughter and i promise we will never buy store brand again..we both loved it..ty for sharing !